Click the audio player to hear the first in a series of special Earthgauge podcasts produced for CKUT radio. The first episode looks at the tar sands of northern Alberta from the perspective of the people who are most directly affected by these massive industrial projects: namely, the First Nations communities living in the region. These are the communities of the Mikisew Cree First Nation, the Athabasca Chipewyan First Nation, Fort McMurray and Fort McKay First Nations and the Chipewyan Prairie First Nation. For this podcast, I spoke with several individuals who are familiar with the impacts the tar sands projects are having on First Nations communities: Clayton Thomas-Muller of the Indigenous Environmental Network; Inuit activist and Nobel Peace Prize nominee Sheila Watt-Cloutier; Shannon Walsh, director of the documentary H2Oil; and Dr. John O’Connor, the former physician in the community of Fort Chipewyan. What do these First Nations communities think of having the largest industrial development on Earth in their own backyard? 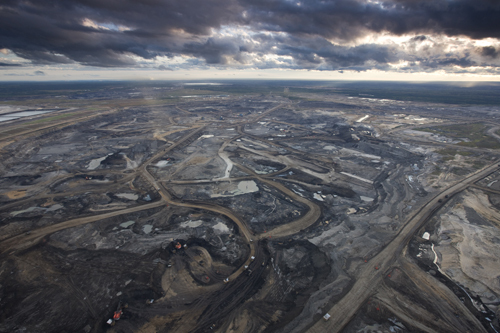 Some are dependent on the jobs and income that the tar sands have created. Others are angry about the severe health and environmental impacts their communities have suffered. And now they want justice. To download the podcast, right click here and select ‘Save as’ or ‘Save target as’.